Rainbow carrots! 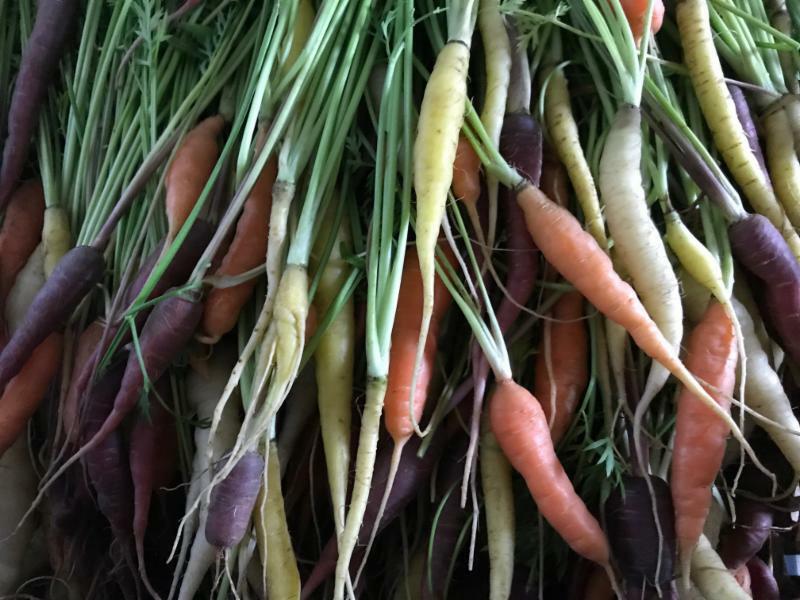 We always love pulling carrots from the soil, then making beautiful bunches of these delicious treats, and there is an extra bit of joy that the rainbow carrots provide. As we step closer to autumn, we’ll have more carrots, beets, radishes, turnips and greens in the harvest. Meanwhile, the tomatoes in the field and in the tunnels are starting to slow down, but we still have some to offer this week and hope to have more at least the next couple weeks. Basil has done better than ever this year, and we’ll have one last taste this week to pair with the tomatoes. Over the last decade basil grown in the northeast has been increasingly threatened by a fungal disease called Basil Downy Mildew. Typically we’ve seen the symptoms begin — yellowing leaves, followed by purple/gray spores and then leaves dying off — in late July or early August, and within a couple weeks our basil crop will be finished. This year, despite the wet and humid summer conditions, our basil crop has been mostly clear of this mildew, so we’ve been harvesting and distributing it to you as much as we can. We hope you have been able to put it to good use, and hope to have similar long-season success with basil in the years ahead.